I hope you've been enjoying the My Creative Time sneak peeks this week! We've got two more fun new sets to share with you today: The Sky is the Limit and Fun Stitched Clouds! Starting with Fun Stitched Clouds, you can see all three that are included in the set right here on my card. Aren't they adorable? 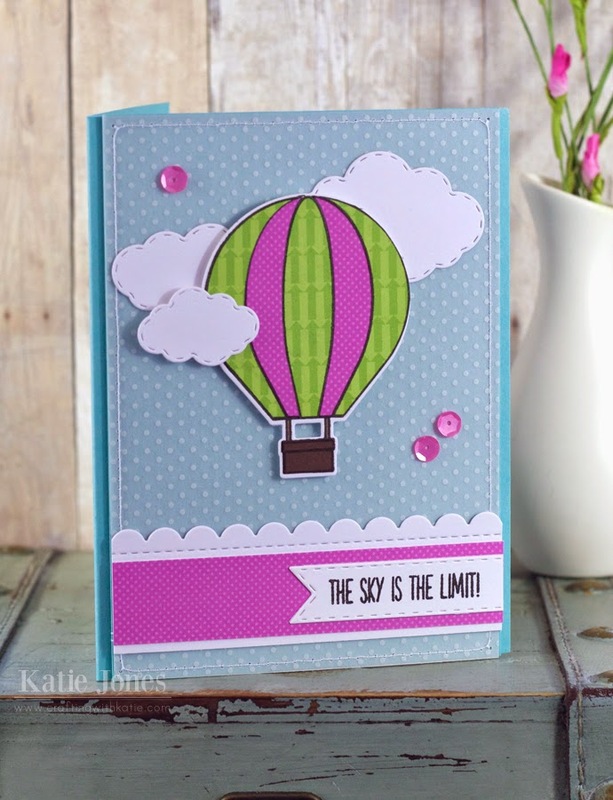 The Sky is the Limit is an adorable stamp/die set that includes this sweet hot air balloon die with coordinating stamp, which I paper pieced, along with several other dies and some fun sentiments, including the one I used here! I stamped my sentiment on a die cut made with the Vintage Stitched Label Die. I also used one of the Fun Stitched Edges Dies to get my sweet scalloped border. And the base of my card has more of that Papertrey Ink patterned vellum on top of hawaiian shores cardstock for a fun look! Gorgeous card Katie... love the papers and colors! Love the colors! So very pretty! Fabulous card! Love it! OMG Katie what a Gorgeous card!! The colors are so beautiful I too love how you nestled the hot air balloon in the clouds what a clever idea and your border is so sweet as is your touch of sequins. Couldn't help but notice your vase of flowers nest to your card that is so pretty too. Super great creative job!! YOU so ROCK!! This is such a beautiful card Katie!!! LOVE the papers and colors and the card LO is perfect! I am just loving your card! Such beautiful colors! What a sweet card! These colors really play well together! Such a sweet card! I love all of the elements you used including older dies and new ones! Fun and colorful! Like the paper piecing! Love the bright colors of the hot air balloon and the banner -- so eyecatching! Beautifully done, Katie! Those papers are delish! Love how you sewed the vellum to the card. Awesome job! Love your card, the colors are so pretty together good Job!!! Love the use of dimension and patterns with your balloon. Love the soft look using vellum on your lovely card. Great job! Katie, this is beautiful, especially with those colors that pop. Very pretty. I like the paper piecing and the vellum panel. Katie ~ Oh my this is BEAUTIFUL! Love the bright colors you used and then the soft subtle look the vellum ( which I am dying here over) give the card/scene! BEAUTIFULLY done! Such a beautiful card Katie. Love the bright colors. Awesome job. This is a very pretty card with all the warm colors you chose, makes you very, very happy! Love your fun paper pieced balloon! Awesome card in pretty colors! Love the stitched clouds and balloon dies! Love the color combination on this card. Wow, that card is beautiful!! I think your card is superb! I love the vellum paper, it turned out so cute! Thank you for sharing! Such a Beautiful card!! Amazing job! Love the brightness of this card! So pretty! awesome card. i love the colors. What a fun cheerful card! Love the paper piecing. Wow! Thanks for sharing your sweet hot air balloon card. Love the design paper. Wow! The vellum is so pretty and really changes the Hawaiian Shores color. Great paper piecing and papers. I love how you did your sentiment and put the scallop edge. Beautiful card. Perfect touch with the scallop border. Very pretty! Beautiful card Katie. Nice colors. Gorgeous those colors are striking together! !